My eye was drawn to the horizontal cleft in the rock on the right. I would love for that to be a pathway carved in ancient times by humans, but I suppose it's probably just a natural cleft. 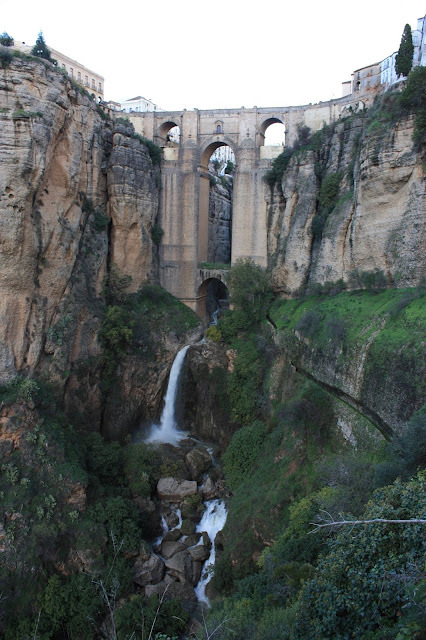 The detail on this picture: https://brigoesglobal.files.wordpress.com/2013/03/dscn6665.jpg (you can magnify the image further), together with this blog post: http://www.thewanderblogger.com/hiking-puente-nuevo-bridge-ronda/ , strongly suggest that it is a cutaway. Thank you, Andrew! On that enlarged photo I can clearly see people entering the cleft at the distal end, and the angles of the zig-zag area at the bulge of rock looks man-made. Though the proximal end is quite verdant (overgrown?). I'm guessing now that it is a natural cleft that was enhanced by the addition of a walkway. Not that it matters. But it would be a cool place to visit. The footpath, as anonymous says, angles down from above it; the thin line of trees along the top right of Andrew's photo are the footpath coming down the face. As someone with a fear of heights I found Ronda's siting spectacular and terrifying. While my wife could hang her head over the bridge (and many other viewpoints) to look down, I had to stay back several feet. We did walk down the path, but there were several points I was pretty itchy over. There is a largish house here, the last "palace" of the last Moorish ruler before they were routed from Ronda. It has a staircase which was hand carved to enhance a natural vertical cleft in the rock leading down from the town to the water below. It allowed the town, or at least the ruler, to send servants (allegedly captured Christian slaves) down the steps with buckets to bring water up in times of attack/siege. The steps exit onto a calm section of the stream/river, protected from view. Worth traversing the 300-odd steps down and up. The town is beautiful. And like many small European towns, lots of streets where both walls bear the marks of door paint from cars scraping through the barely-wide-enough spots. Luckily I didn't have to drive in the town a lot, just enough to get to our hotel. Thank you for the info and link, embeetee. "Slouches towards Bethlehem to be born." Is there a "war on Easter" ? Money and politics. And money. Details about "The Great Escape"
"Giant metaphor crashes through the ice"
Want a "blueberry banana smoothie" ? "There will come soft rains..."
HMB = "Hold My Beer"
The musical theme of "Cinema Paradiso"
"Jill's Theme" in "Once Upon a Time in the West"
Ennio Morricone's "Ecstasy of Gold"
Sung-bong Choi performs on "Korea's Got Talent"